Many Nigerians in the northeast have fled Boko Haram attacks and now live in refugee camps. Maiduguri — Nigerian cities are battling an influx of tens of thousands of people uprooted from their rural communities by the Boko Haram terror group northeast of the country. 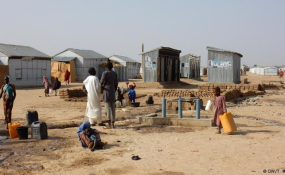 "In one camp that received a particularly high number of people, the infrastructure is close to collapse," said Markus Dolder, International Committee of the Red Cross (ICRC) regional coordinator. "There is less food and clean water available. Access to health care is limited. Given the level of overcrowding, there is a heightened risk of disease outbreaks," Dolder said. "Some people have never been to a big city before," Khayat said.